Thearica, My Special Santa, sent a box filled with goodies!! Would you believe this sweet friend made the effort to track down my daughter by phone just so she could ask about my likes and dislikes!!? I was so impressed and even more so when my daughter shared with me (AFTER I received my gift) just how kind and sweet Thearica was over the phone!!! One more Look at Cookie Jar bottom right. Rudolph stole the Candy !!! Beautiful Card with such Kind Thoughts...Thank You Thearica..from the bottom of my heart! My Model is my 13 yr. old Grandson who Bravely allowed Grandmama put an apron on him. He is such a sweetheart...none of this 13 yr. old smart mouth I used to hear when teaching. He has such a heart for people in Third World Countries without Clean Water!! Truth: I still have to put in the lining. I've never made a bag before so this took me FOREVER! fabric so they can be used all year round. These are made to fit the receiver's "LIKES"
Disclaimer: My son makes these in his wood working shop. He made me one out of cedar wood and background is Burlap. Each one is custom ordered and my picture doesn't show the beauty of the wood. Table! 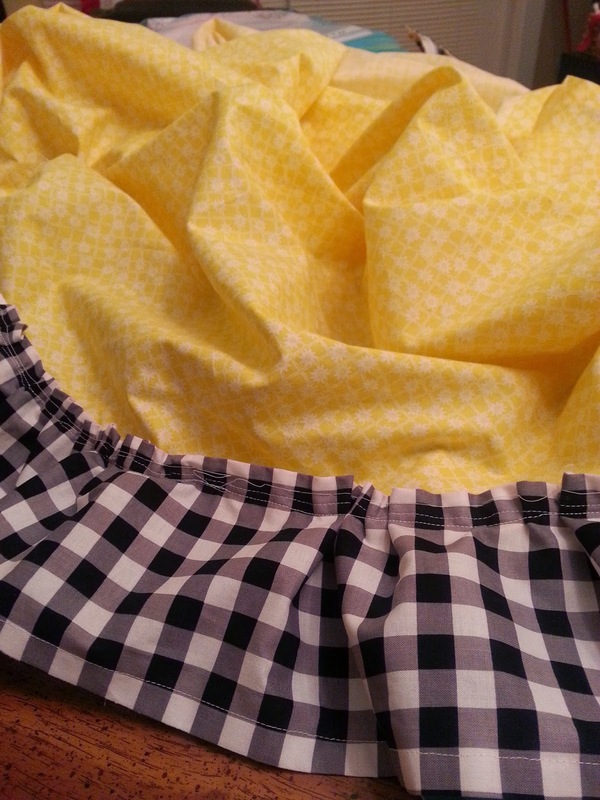 Matches the Curtains only they are Black Gingham with Yellow Gingham Ruffle. You got lots of gorgeous gifts, and you made many good looking ones yourself! Thanks for sharing. Wow! What super gifts you received! And great ideas you shared. Thearica set some wonderful gifts. You made some great gifts too. Love your bag and apron. Very lovely. Your grandson sure was mighty nice to model the apron for you, which is very pretty, by the way. 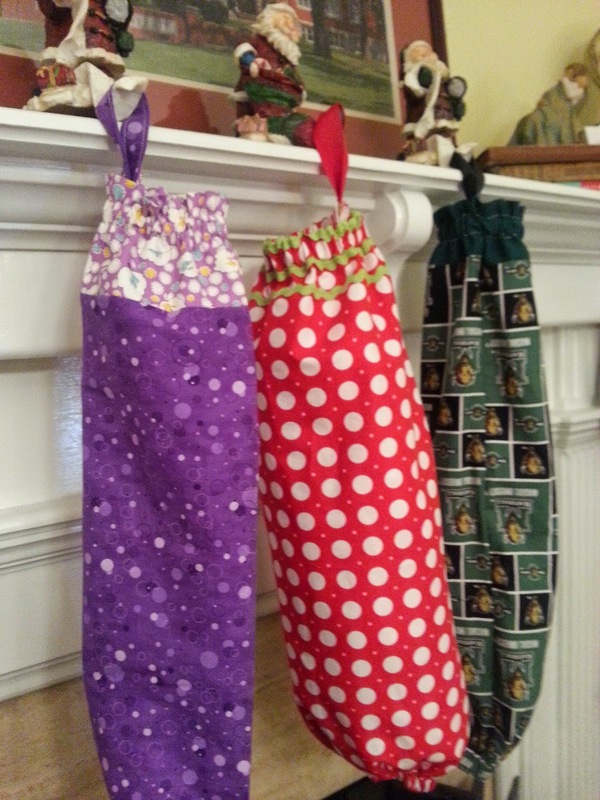 The tissue covers, purse, bag-its and all are perfect for the hop! Thank you for being a part of the hop. p.s. I was thrilled to be sending my gift to you down there in Alabama. What wonderful gifts you received! And such great items you shared. Especially love that apron and the purse. Well done! Jane, you received lovely gifts. Your gifts you made are terrific. Aprons are always welcome gifts and your different bags look great. Happy holidays to you. Lovely gifts from Thearica! Love your apron...and your model is a real pro! Love that cushion Rudy is sitting on! 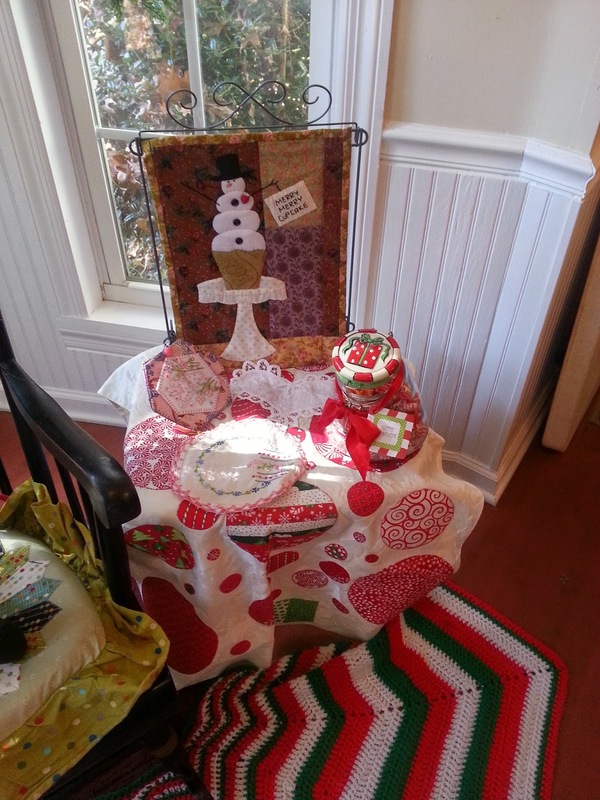 Great gifts and I'm really excited to see pics of your finished sewing room! You received a bounty of wonderful gifts; I really love that snowman cupcake piece! Your projects & ideas are all great. I love the purse and the apron! Wow Jane, Thearica sent you some very wonderful gifts and you many many great ones too ! I love that your grandson modeled the apron for you...and tissue covers are great...I have one I got as a gift and I love it. I also got a bag holder as a gift and it's one of my all time favorite things ! Wow! Thearica really sent you a lot of cute things. And you have made a lot that will be on my list of things to make. I really love the apron(and model). I also love the tissue holders and bags. Thank you so much for sharing. Wow, you were certainly spoiled Jane! What lovely gifts you received. And lots of great ideas for gifts, thank you. Beautiful, festive gifts. I would leave them all displayed exactly how you photographed them. Such a wonderful array. Your purse and apron are lovely. Did you have to promise to not show your grandson's face if he modeled for you? ;) I loved that picture. I really like the card holder and how you decorated the little clips. Great idea. Thank you so much for sharing. Can't wait to see your sewing room. Enjoy your holidays. Wowzers Santa Thearica was so good to you! And your gifts are wonderful too. Your model is such a sweet boy! Anxious to see your sewing room. Oh my goodness...Thearica certainly showered you with wonderful gifts! 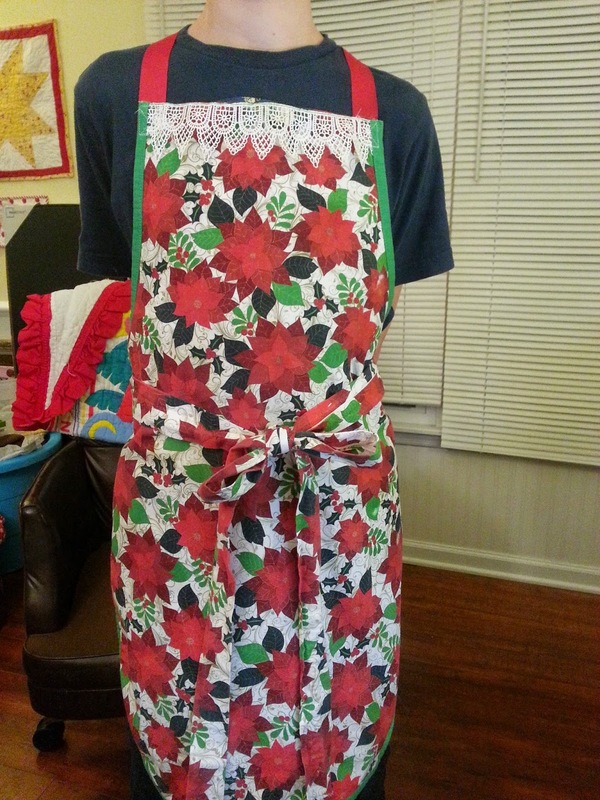 Your purse and apron are would definitely make great gifts! I like the tissue and the bag holders. What a sweetheart to model your apron for you. Your tote is beautiful!! Bag patterns can be difficult, but they get easier the more you do. Kudos to you for doing such a lovely job!! What lovely gifts, ALL OF THEM! 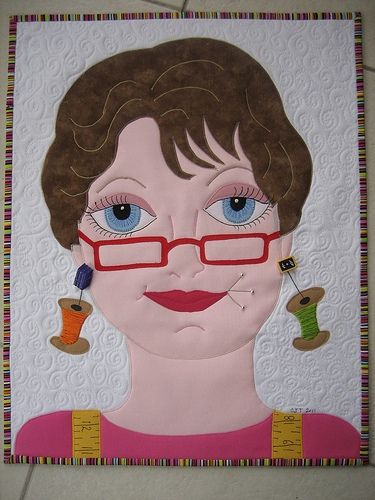 It looks like your sewing room is going to be all bright and cheerful. I would want you to be my secret Santa! What great gift ideas!! Yes, that grandson has your sweet heart! He had a great model to follow! WOW, what a collection of gifts to be seen. Jane, it looks like Thearica spoiled you just right. Love your projects. 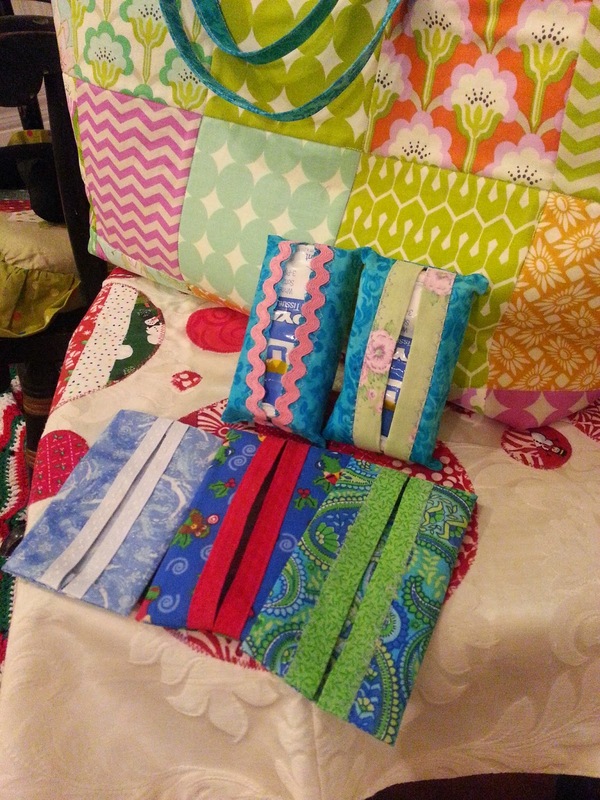 Do you have a pattern for the tissue covers? Spectacular...and I'm not surprised one bit.. That Thearica is something else! 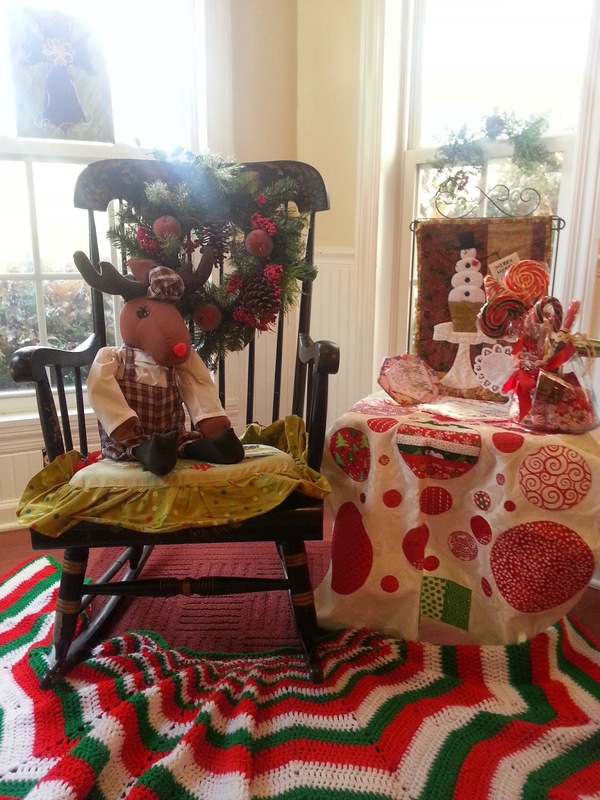 What a fabulously festive display! 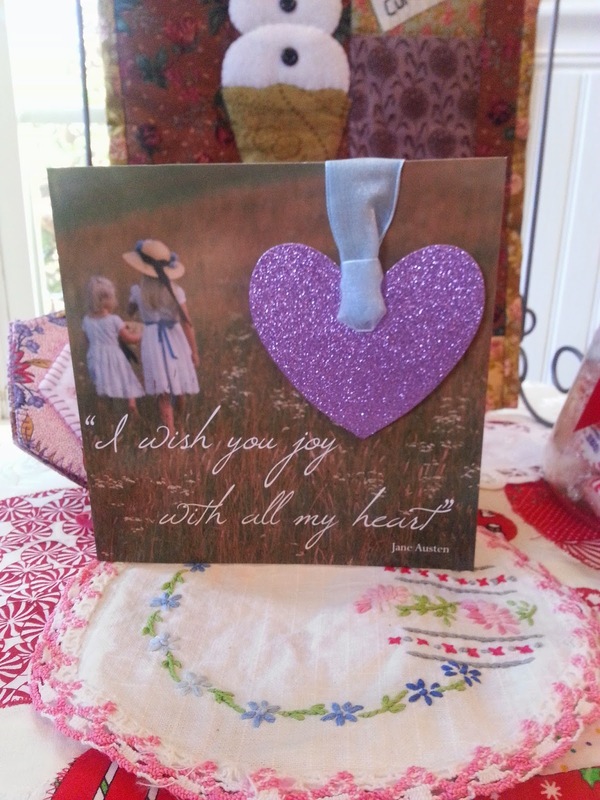 Beautiful card holders your son made...and what fun and functional quick gifts you share! Great bag. Lovely colors, fabric and design. You'll be hooked making bags. Great apro on the brave and helpful model. Lovely gifts! Your bag is really pretty and will be fabulous when you get the lining in it. You got some lovely gifts. I love the cupcake snowman! 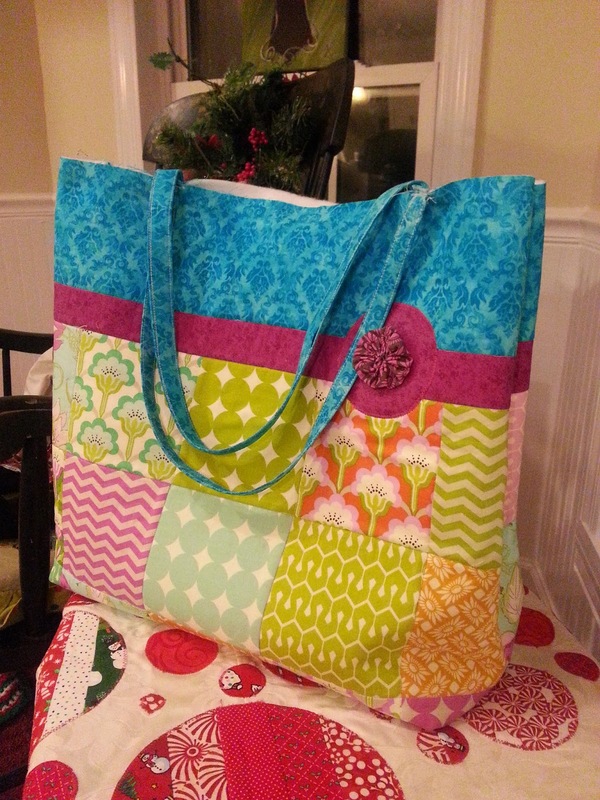 You did a good job on the tote, and thanks for sharing your other projects. I really need to make some of those bags. I am definitely going to make myself a couple of bag holders...I have plastic bags blowing all over the garage when the door opens. So good to hear that there are still wonderful teens being raised...I really dreaded the days I was assigned to teach middle school. Enjoy all those wonderful gifts received and Yuletide Blessings to your family. Great job with your first bag ... truly an accomplishment and even better once your lining is in place :) ... Thank you for sharing all of your projects today and I wish you enjoyment with your wonderful gift received .... Best wishes to you. Loved your projects and the gifts you received. Hope you have a wonderful holiday season. Beautiful gifts received and beautiful gifts you made. Thank you for sharing. Wow, you must have been a good girl this year. Beautiful gifts and great sweets. I really like the tote. But the table skirt has my attention, are you gonna share a picture of the finished room? Hope so. Love all of your projects! The tissue holders are my favorite. Thank you for sharing and Happy Holidays!!! Looks like Santa has been to your house a month early! ;o) Lovely gift ideas, Gmama Jane. 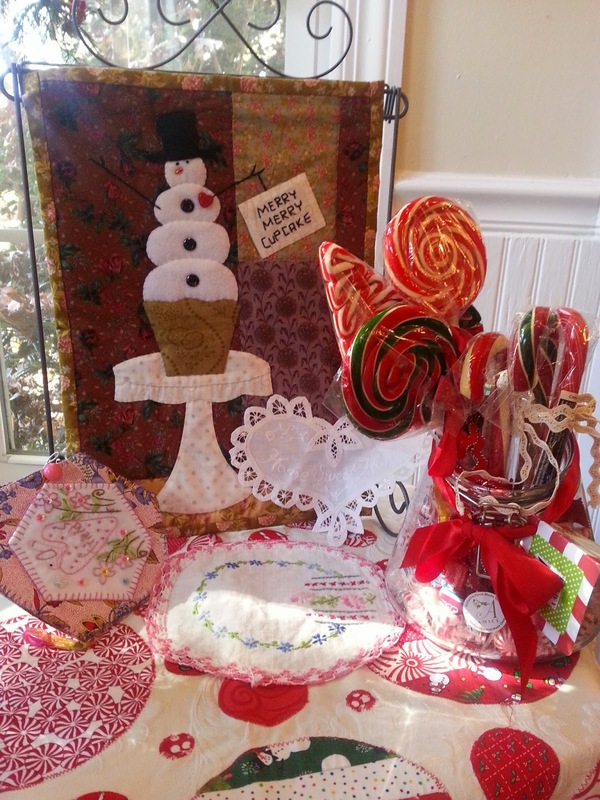 So nice to have handmade gifts specially made to the tastes of the recipients. Oh, my! Thearica must be one of Santa's helpers. Enjoy those sweet gifts and thanks so much for sharing! 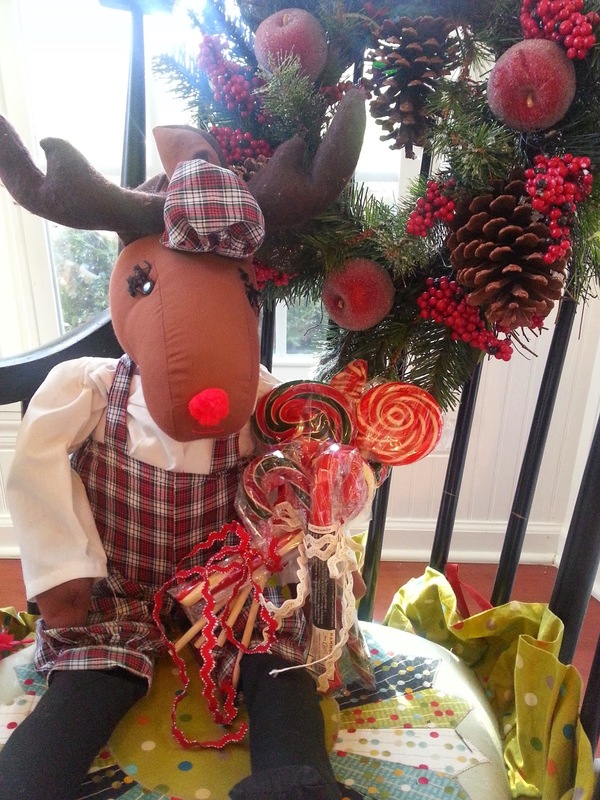 Such fabulous gifts you received from Thearica! Thank you for sharing your ideas for quick, easy gifts. Santa has been good to you this year,all your gifts are beautiful! Tove the tote bag and tissue holders,thanks for sharing! I love all the gifts you created, especially the card hanger. Too cute! Thearica sent you some beautiful presents. Have a Merry Christmas! Well your stocking was certainly stuffed. And your gift ideas are lovely! Merry Christmas! Wonderful gifts given and received! Thanks for all the ideas. Thanks to your grandson for the wearing of the apron and adding his gift idea to the hop. too. What an adorable mini you received! My first bag was tricky too. Didn't help that there was an error in the pattern that my lack of experience didn't know about! But hang in there. Make a few more cuz it gets easier each time. Lots of lovely gifts you made. Thanks for sharing. What great gift, thank you for sharing with us all. You gotta watch those reindeer like a hawk!! especially if they like candy. 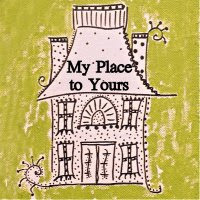 :) Wonderful gifts - and how neat that you love vintage. Thanks for sharing your ideas for quick gifts. BTW, your bag was worth it; it's adorable. Beautiful gifts, received and made!!! Looks like it will be a Merry Christmas in your house!!! Hi Jane! Your grandson is a keeper, what a sweet fellow! I am also very interested in the water projects in Africa. If he hasn't read the book, A Long Walk to Water by Linda Sue Park, I would highly recommend it. It's a great book and a true story. Anyway, I loved your post and even though your bag was frustrating, it was totally worth it, because it looks awesome! You were spoiled by all those wonderful gifts!! I like the apron and tissue holder ideas! I love my plastic bag holder, those are awesome gifts. 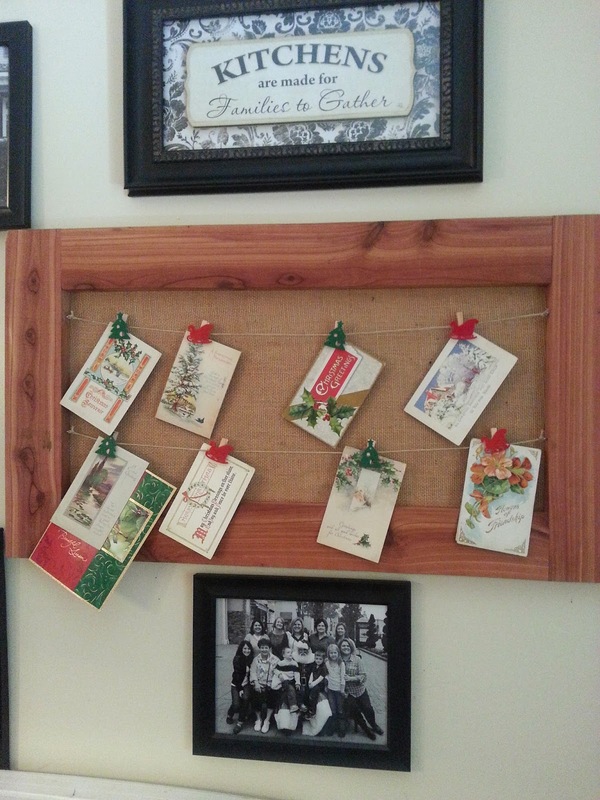 and your son does beautiful wood work, what a lovely way to display cards. Beautiful card and beautiful gifts from Thearica...a thoughtful lady. Thanks for sharing your quick and easy gift ideas...love the apron, such a sweetie to model it...he makes Gmama's heart sing! Love your bag too...looks awesome!! Happy Holidays Jane!! Lovely projects - thanks for sharing. You recived wonderful gifts, lucky you! Great projects! Love the bag. It always takes me a while to make new pattern, but after the first time I can zip out another one in no time flat. Thanks for the inspiration! You received the most darling gifts from Thearica! What a thoughtful way to find out what would best suit you. And the gift ideas you've shared are lovely. I love making those plastic bag holders - they are so useful as well as pretty and that always makes for a wonderful gift. What a sweet boy to model that gorgeous apron - I think those always make lovely gifts as well! I really love the card holder your son made, and the Christmas apron your grandson modeled is gorgeous! Thank you for sharing your ideas! Wonderful gifts from Thearica. Lovely apron, and such a special model. Your sons card holder is awesome. I think talent runs in your family. Have a Merry Christmas .